Most people go grocery shopping with a list. That’s pretty basic, since it tends to help ward off the sticker shock that comes with binges of impulse shopping. And of course it’s worse when you shop hungry. But sometimes, I go list-less anyway. Like I just did on my first visit to Black Cherry Market in Salt Lake City, a store you should know about if you love condiments and other delicious surprises. Open for about a year, this little Mediterranean market is a clean, well-lighted place with wide aisles and a really nice vibe and, no sticker shock. Here’s some of what I ended up with – totally random, starting with two condiments. Ararat Rose-Petal Preserves from Armenia. The frilly pink label tied over the lid of the fat little jar was irresistible. I can’t wait to try the fragrant, sugary preserves on some old-fashioned biscuits, or a croissant. Maybe with some rosé and goat cheese. 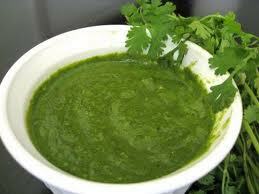 Coriander Chutney. A staple at Indian restaurants everywhere, this seaweed green blend of cilantro leaves, green chili, ginger, coconut, lemon juice, and cumin is a condiment staple. Great on lamb burgers or alongside roasted lamb or chicken, super with a grilled steak, or swirled into hot basmati rice or into plain Greek yogurt for a really good vegetable dip. Hearts of Palm in a jar. I know. Don’t get too excited. But really, they are not that easy to find. The tin-can version tastes of tin. I can’t wait to make the hearts of palm salad with blood orange from The Canal House Cookbook No. 6. 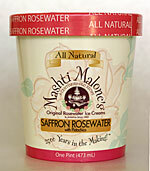 Mashti Malone’s Pistachio Saffron Ice Cream (and other flavors). From the famed Mashti Malone’s at Sunset and LaBrea in LA, this is a find in Salt Lake City. Creamy, herbal and really good. Two pounds of plump, preservative-free, pitted Deglet Noor dates were just $6. Perfect for a party appetizer if you wrap each date in a band of prosciutto. Sizzle under a broiler for a few minutes (watching carefully), turning once with tongs. Stick a sturdy wooden toothpick in each one while they’re hot and pass them around. Sweet, salty, simple (like Devil's on Horseback, the easy version). In search of pomegranate molasses? Black Cherry carries several brands and that link will take you to all kinds of recipes with this staple of Mediterranean cooking. Black Cherry also carries Halal meats and Canyon Meadows Ranch grass-fed beef from Altamont, UT. Told you, this was random.